The fear of turning old has been recurring all through these last few months. Not that the grey hair would bother my ego, not even the flab of dry whitish-brown skin protruding out from the calcium-less bones. I for once haven’t tried being conscious of my looks or even the ever growing beard lately. Most of my life has been without any particular fear. In more liberal fashioned tone, it has been ‘fearless’. As I’m driving away in the dark to seek solitude, the fear develops stronger. It brings some quick sweat on my face and the deep forehead, added along is some rattling effect on my nerves. With my right foot pressed hard against the accelerator on this empty city road far away from the city of my thoughts. The racing heart is faster than the car at this point. I wish to stop and run away to my ‘home’. Though I know I can’t. There seems no ‘bring to an end’ to this journey. The farther I travel, more I seek to return. The time dissolves into memory. In this thorny path ahead of me, I see an identity-less non-stop journey into darkness. The journey itself begins in darkness of hope. An ironic life of a wandering soul! Most nights are spent in the ‘white and black’ of the unseen past. Past being a predicament as much as the future. 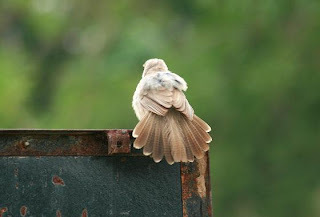 I stare at the photograph of a rare sparrow sitting on the gate of a mausoleum with her back turned towards me; on the front is a ‘hazy green’. One of the many photographs pasted above my work desk. The haziness of this forced journey is unpredictable. In this concrete jungle, I do not long for another machine. All I yell for is my lost abode. Is it the fear of turning old? Or, perhaps of being a ‘homeless’ at the fag-end of life; an ordeal haunting an exile. ‘Freedom is a prison for the exiles’, says an author friend. I remain confined in that prison lark. Just as the withered dislocated leaf of ‘Chinar’ which narrates the agony in its fire brown tint before being crumbled, the fear in me shall pass. The silent journey alone to my homeland shall never end. I shall remain young forever to recount the ‘untold story’ of a forgotten tribe. The tribe that existed in their homeland, not so far long ago! ज़िन्दगी यूं ना हुई बसर तनहा, काफिला साथ और सफ़र तनहा! हमने दरवाजे तक तो देखा था, फिर ना जाने गए किधर तनहा! Beautiful piece of writing Aditya! It just touched the deepest corner of my heart!!! I am so far away and yet feel so close to home!!! kashmir is in our blood running through our veins..
You are not a good person..You pull out the memoirs off the grave every time it succeeds to get buried.. Simply conveyed, but deeply engraved; virtually embossed thoughts of every member of the forgotten tribe, reflected by you with meaningful expressions in poetic style. So down to earth that even the soul of Shakespeare would be turning in its grave to hear the lines of his compatible competitor at last after 400 years. Bhaisahab, if not I, then my family will see to it that all Kashmiri Pandits return home. I promise, we promise. Aditya, what can I say but share my shoulder with you. Our bloody political machinery, playing minority vote bank politics, has deliberately played into the hands of those who have no right to singularly claim an entire region as being theirs and relegating the other section to either being second class citizens or refugees! Ridiculous! It has been the Congress through and through right from the comical Nehruvian days, that has brought about this plight upon our Kashmiri Pandit brethren. A Hindu Rashtra where Hindus themselves are refugees! Where else in the world can this happen but other than in Hindustan under the bloody rule of congress. I sincerely hope and pray a day comes in my life time at least, when you all get back to your hometowns and live like you have lived always. I pray! "I didn't go to the moon. I went much further — for time is the longest distance between two places. Not long after that I was fired for writing a poem on the lid of a shoe-box. I left Saint Louis. I descended the steps of this fire escape for a last time and followed, from then on, in my father's footsteps, attempting to find in motion what was lost in space. I traveled around a great deal. The cities swept about me like dead leaves, leaves that were brightly colored but torn away from the branches. I would have stopped, but I was pursued by something. It always came upon me unawares, taking me altogether by surprise. Perhaps it was a familiar bit of music. Perhaps it was only a piece of transparent glass. Perhaps I am walking along a street at night, in some strange city, before I have found companions. I pass the lighted window of a shop where perfume is sold. The window is filled with pieces of colored glass, tiny transparent bottles in delicate colors, like bits of a shattered rainbow. Then all at once my sister touches my shoulder. I turn around and look into her eyes. Oh, Laura, Laura, I tried to leave you behind me, but I am more faithful than I intended to be! I reach for a cigarette, I cross the street, I run into the movies or a bar, I buy a drink, I speak to the nearest stranger — anything that can blow your candles out! For nowadays the world is lit by lightning! Blow out your candles, Laura — and so goodbye. . . ."
‎"The Journey Itself Begins in Darkness of Hope..."
all this while my class mates sitting by my side, are planning a trip to kashmir!! it hurts..
"The farther I travel, more I seek to return"
:) its very well written. Understood it completely. To say that I understand your pain would be a lie. You have etched your pain in words that only pain can relate to. "The silent journey alone to my homeland shall never end. I shall remain young forever to recount the ‘untold story’ of a forgotten tribe. The tribe that existed in their homeland, not so far long ago!" - Hope lies in its existence in you. I do not know what keeps you breathing everyday as I can feel myself choke with tears, to not be able to return home and try to make everything seem like home, is all the same painful. But we stay afloat, we find strength in our like and we live. God bless you. I have seen many of your interviews, I completely support you for Kashmir. It is impossible to ever give kashmir azadi because three countries are inovlved: India, Pakistan and china. Kashmir is also divided into many tribes. If kashmir go for indepedence it will result in fragmentation of kashmir into little pockets. Any way if they only want kashmir velly, again not surviable as an independent entity. It is impossible to change minds of separatists in Kashmir, but way to do it not through force but propoganda. Trust me this works best. US is using this to fool its citizens for years. Of course, in this case we are not fooling them, but rather make them patriotic to India. How to do this:--economic opportunities provided by staying India citizen, economic set back if they separate, fear of Pakistan and China, and most important one to one dialogoue with separatist and presenting them with future aspects if become separate(export/import of goods) to change their mind. It is good to even to make a movie (that will show what I said above). Spread the video. You can You can only win if you change the mind. And I do not if it is possible, occupy kashmir with hindus from India, once there is hindu majority, do a referendum or separatist will never speak up. Lastly, I hope you join political party from Jammu and Kashmir. With Power, you can change many things. With 1 year, of good propoganda either by engaging one-on-one with kashmir residents or through vidoes, there will never be separatist movement. I am so surpised Indian goverment never use this tool, US and Israel goverment are expert on this. If you watch US media, you can see how Israel goverment have ensured US people love Israel for ever. Any way to reply me pooja202005@hotmail.com. I have many solutions, it is so easy to manipulate human beings, with this technique you can win anything. This way you will get Kashmir for everyone, Indians and Kashmir pandits and Kashmir musulim and other tribes. To do this, if you need money, get it from indian goverment (govering party). Whichever, party is in power if they can solve this, they will win many indian votes so they will give you money. End this conflict for all.